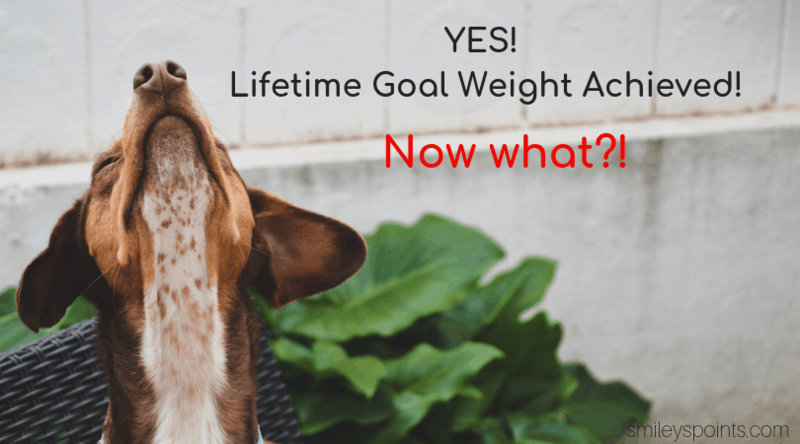 Achieving Lifetime with Weight Watchers is an amazing accomplishment! You may be tempted to celebrate, and rightfully so – but make sure the celebrations don’t involve too many points! 😉 Follow these tips for maintaining Lifetime Weight with Weight Watchers. Now that you have achieved your goal and gotten to your Lifetime Goal Weight, how do you keep the extra pounds off? How do you maintain your goal weight now that you have gotten here? What are the steps necessary to continue to have a fit, healthy life without getting onto that roller coaster ride of weight gain and loss? Let’s talk about all of those things (and more!). First, realize that your weight does fluctuate and you will not be the exact same weight all the time. There are a million factors that play into your weight fluctuation, especially if you’re a woman. Allow for a 5 pound +/- fluctuation at any given time. Choose your weigh-in days wisely! If you know you eat a ton of salt on the weekends, don’t weigh in on a Monday! If you know your “time of the month” is the first week of the month, choose another week to weigh in just to be safe. As a Lifetime Member, you only have to weigh in once a month so keep that in mind when choosing your weigh in date. 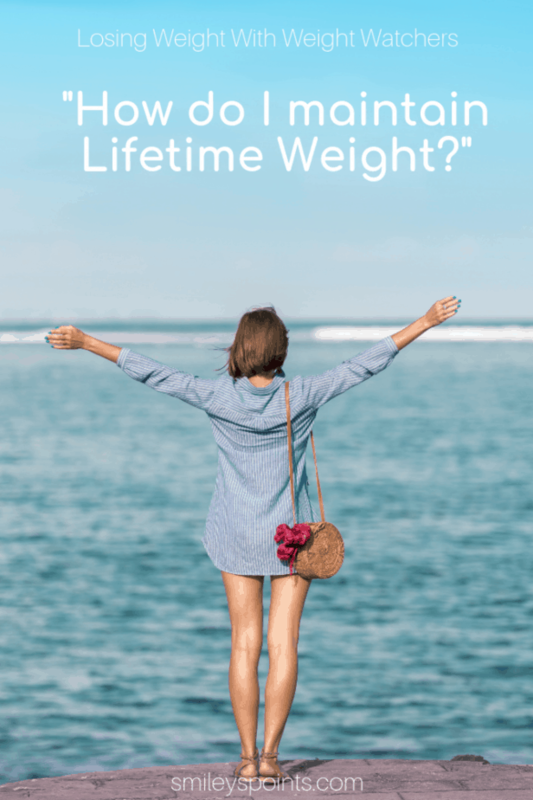 What are the benefits of achieving Lifetime with Weight Watchers? Weight Watchers outlines the benefits of Lifetime on their website. To sum it up, as a Lifetime Member, you get free meetings and etools as long as you weigh in each month, and are within 2 pounds of your Lifetime Goal Weight (+ or -). You will get an eTools voucher from your Weight Watchers coach when you weigh in, assuming you’re at your Lifetime Goal Weight. With rewards come responsibility, right? Much like WW outlines the benefits of Lifetime, they also tell us about the responsibilities. You must weigh in at least once per calendar month, and stay above/below your goal weight by 2 pounds or less. If you miss a weigh in, you’ll pay for that month but can still get future months free if your goal weight is maintained. You can pay as you go if you happen to gain/lose too much to stay at your Lifetime Goal Weight during any month. Get back on track as soon as possible so you can go back to getting meetings for free! Steps to maintain your Lifetime Weight once you have achieved it. Lean muscle mass. Have you heard of it? Of course you have, but do you know how it works? The more lean muscle mass you have, the higher your metabolism is – aka the more you fat you burn. To maintain your current weight, consider adding weight lifting to your exercise routine if you haven’t already. If you have been lifting weights already, continue adding small amounts of weight at a time to keep your muscles challenged. This will help keep your metabolism up and your weight in check. Pitt Researchers find long-term weight loss in women who exercise at least 40 minutes, five times per week, and they kept the weight off the rest of the year! Eat zero point foods that are high in protein – think chicken, eggs, beans… and high in fiber — think fruits and vegetables. These foods will help you to maintain Lifetime Weight. Choosing foods that are high in protein and fiber will help to keep your metabolism up, too. A study of approximately 300 women found that those who avoided weight gain the best were those who ate meals kept them feeling full. Weight Watchers is a lifestyle, not a diet… and the reason I love it so much is because you can eat what you want, within reason! No food group is off limits, you just have to count your points. How easy is that?! While you can eat what you want within reason, you also have to watch out for your own personal pitfalls. You know what you can and can’t eat, you know which foods may trigger you to binge. To avoid daily temptations, plan ahead! When eating out, split a meal with a friend or get a box right away and bring half of your meal home. The portions at most restaurants are absolutely ridiculous. There’s no reason to eat a pound of pasta or a 1 pound burger and fries! Eating out less can also help. Fast food is full of sodium and usually carbs (and points! ), so it’s best to avoid that temptation. Ban your worst weaknesses from your house, and don’t feel bad about it! If you know you just absolutely cannot resist Ben & Jerry’s, ask your family to help you out and leave it off the grocery list for a while. Keep your goals in mind. You have finally reached that challenging goal you set, so maintain it by continuing to eat healthy and exercise regularly. Track every bite. Every sip. Every taste. Use the Weight Watchers app to keep a running total of your points throughout the day as that helps you keeps track of your protein, calories, fat, saturated fat, carbs and fiber consumption. Continue use the app and the point system, even when you have reached your Lifetime Goal Weight. The habit you have created and used to achieve your goal weight will help you to maintain it. Don’t start slacking off just because you have achieved Lifetime – that is the easiest way to backslide! If you eat a little too much, go for a longer walk than usual, and drink lots of water! Yes, you knew it was coming… you have to eat breakfast! It’s called the most important meal of the day for a reason. Women who regularly eat breakfast are more successful with long-term weight loss than those who skipp the first meal of the day. It’s best to eat healthy, filling meals regularly: eggs, Greek yogurt, and fresh fruit are all great breakfast options. Always start out with a good breakfast to avoid splurging or overeating on special occasions and holidays. YESSSS! You’ve achieved Lifetime. You’ve got this! Stress can cause weight gain, so chill out and don’t worry too much about your next weigh in. Be mindful of what you’re eating and drinking, how much exercise you’re getting, and how you are treating your body, and you will be on your way to maintaining Lifetime in no time!